Today I am here with Andre Guenes in Brasilia because I just made a seminar. 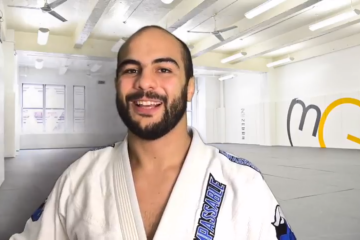 Andre is going to show us one of his favorite moves that is a pass from the top half guard. 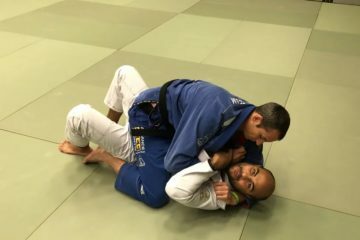 He just showed me and I know this position very well, it is very annoying when someone gets on top in the half guard and starts to do this. Andre showed me this move with very good details so let’s see how he does it below and then I will break it down. I also have a very good friend, “Cascao” who was in the finals of the worlds this year with Cobrihna and he loves this position and Andre breaks it down very good. Guys so if you can notice above, he grabs a cross face on my head really really tight, he also likes to grab my hip with the other hand. Andre likes to do this position when the person gets the underhook. I think that is one detail that makes this a very good position. Any good half guard guy is going to try and get the underhook when playing the half guard. This is a good move because you can counter this. Once Andre has all of his grips in place, he starts to do a knee cut, what makes this pass so powerful is that he is using so much pressure on my face. The cross face makes it very difficult for me to turn into him even though I have the underhook. As he is knee cutting, I cannot retain my guard because of all the head pressure. Once he knee cuts through my guard, he goes strait to the mount and ends up scoring 7 points. Guys this is a great move for competition. Since he has so much pressure on my head and hip, I cannot really move to defend. Anyways guys, this is a great pass! Try it out! 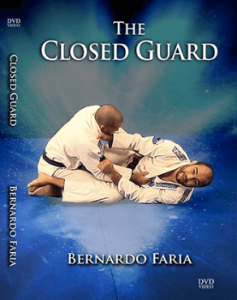 Also, don’t forget to get my E-Book I really think this can help you grow your Jiu Jitsu! Also, check out my DVD Closed Guard below!